Organisational progress, success and resilience are more likely when work in the business (doing the work) is sufficiently balanced with work on the business (improving how we work). But in reality, that balance is rare. This discussion describes common signs of that imbalance, its common causes, and what might be addressed to resolve them. Work in the business focuses on the Primary Task – the matters necessary for the organisation to stay in business. 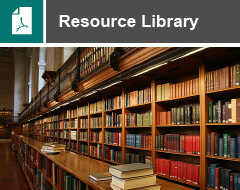 Work on the business develops capacity for the Primary Task – efforts to fine-tune resources, systems and processes for the best possible functioning and outcomes. Despite the self-evident logic of the need for balance, the principal focus of workplace planning, organising and development is usually on the Primary Task: business-as-usual to maintain and extend provision of products and/or services in response to customer needs. Developing capacity for this is usually much less of a priority. Organisations in which this is true may enjoy business success but at the cost of inefficiency, lost opportunity, various forms of “soft waste” such as low morale, high stress levels and unrealised potential for higher performance. Those outcomes are often regarded as acceptable on the basis that something must be functioning well enough if the organisation remains staffed and able to continue in business. Where a greater effort is made to “work on the business”, this tends to be applied with limited scope: how to fine-tune resources, systems and processes for managing the Primary Task. I recently attended as an observer, a high-level leadership meeting called to address and plan “work on the business” in which the entire agenda comprised How to better manage the Primary Task. 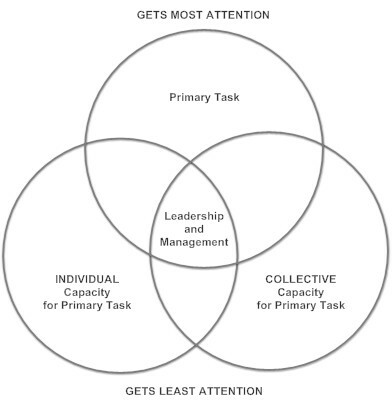 The collective (group or team) capacity for the Primary Task. 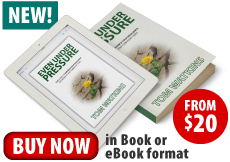 Interpersonal communication, problem-solving, conflict resolution, priority-management, decision-making, emotional agility, attitude-management and other self-management practices. Exemplars, operating systems and behaviours that enhance the ability of staff to cooperate, collaborate and produce real teamwork. The common approach to addressing that problem, is to either (a) identify and cut out anything regarded as non-essential to Primary Task performance and to require staff to work even harder – often with less support; or (b) require that people “must work smarter, not harder”. The difficulty with the first approach (a) is that trying to squeeze more from people who already give of their best while they work within a self-limiting system is pointless and stressful: the problem must be addressed at its root cause – whatever imbalance of “in/on” focus exists within the system. The second approach (b), is a better path likely to yield good progress – but not if it suffers from the misunderstanding I described earlier: a systemic focus on planning, leading and managing the Primary Task while insufficiently developing people’s individual and collective capacity for it. They end up working harder and harder to maintain the status quo. As I spend time working within various client organisations, I frequently see the following signs of these imbalances. Where clusters of these conditions have been long-standing, it’s clear that personal effectiveness and collective morale suffer, and potential for higher organisational performance is diminished. Meetings, often scheduled almost wall-to-wall, take precedence over and crowd out individuals’ opportunities for planning, reflection, creativity, strategic planning, strategic thinking, and energy re-generation. Meetings (on other than formally-structured occasions) are conducted in ad hoc fashion or with little if any attention to commonsense planning-and-management processes, without a clearly-agreed purpose, a pre-determined timeframe, progress monitoring or effective facilitation. Participants leave those meetings inconvenienced, frustrated, angry or dispirited. Meetings involve rapid-fire presentations of ideas and facts (often complex and randomly offered), competition for speaking space, point-making, insufficient clarification, little or no active listening or summarising to facilitate understanding or progress monitoring, and insufficient time/space provided for participants to reflect, consider or “talk ideas into place”. Decision-making and planning models are vague or random; assumptions are made about achievement of consensus or clear commitment to decisions and actions. Inability to meet with key people to make plans and decisions because they are unavailable, attending other meetings. Incomplete conversations “because we have to attend our next meeting”, cause uncertainty, frustration and/or the need to reschedule and repeat discussions. Unwillingness to speak directly (exercising agency or personal authority over one’s own role or needs), to avoid (a) dealing with conflict; (b) being seen as “too direct” or aggressive; (c) hurting others’ feelings; or (d) jeopardising a sense of collaboration and teamwork. Missed opportunities for testing and demonstrating understanding, applying other interpersonal competence, attitude management and emotional intelligence lead to individuals’ disengagement, misunderstanding, resentment, failure to say what’s necessary, and/or the need to repeat or unnecessarily prolong conversations. Incorrect, untested assumptions are made about people’s competence for limit-setting, boundary-holding and conflict resolution. Random, rather than methodical problem-solving processes are applied to discussions about important issues. Urges to be supportive and helpful to others lead to giving well-intentioned advice and “solving” of others’ problems (listening-to-fix or listening-to-correct), rather than displaying deep curiosity, provocative questioning, connecting vital feelings to facts, and leaving the locus of problem-solving with the “owners” of problems (listening-to-learn) – in order to intentionally enhance growth and self-responsibility. These practices contribute to missed opportunities for 1:1 and group coaching. Official Position Descriptions don’t match current reality; they’re regarded as a joke and largely ignored. This can lead to significant role and/or responsibility demarcation confusion. Leaders practice leadership without clarity of a definition, model or criteria of competence of “leadership”. Leadership effectiveness is gauged by indirect measures (such as business target achievement or organisation-wide annual engagement surveys). Direct feedback from the those they lead – frequently, methodically and safely is not sought. “Managing” is sometimes interpreted as “attending meetings”, “initiating or attending other meetings”. Senior leaders exclude the development of their own (individual or group) practices from “developing capacity for the Primary Task”. Inattention to personal wellbeing and energy re-generation: being continuously “full-on” (and often mentally fatigued) without breaks or nourishing meals. Unwillingness (perceived as inability) to balance prolonged activity with reflective periods (even momentary pauses) designed to make sense of and learn from experience, enable creative or strategic thinking, and regain mental energy before rushing into subsequent activities. Priorities are imbalanced in favour of important matters that have been left to become urgent, rather than being constantly those important matters that should never become urgent. The use of “team” to describe groups that are more likely to be team in name only (i.e., merely work role and responsibility groupings not practising teamwork). Planning for methodical team development is avoided or not considered. If you recognise in my “. . . notes from the field” above, signs of this imbalance in your organisation or team, make them your problem-solving and action-planning priorities. If you don’t recognise clear signs and want help to do so, involve a leadership coach. I can provide support within New Zealand, where on-site 1:1 leadership coaching forms the greater part of my current work, and online elsewhere for how-to-begin help.